Dr. Brandy Kragness let go of the wild bird she had cared for all winter and watched Bolt swiftly launch himself into the wind, flying strong and sure across the stubble field. It was an exhilarating moment for Kragness, a clinical intern in zoological, exotic and wildlife medicine at the Western College of Veterinary Medicine's (WCVM) Veterinary Medical Centre. She had seen Bolt at his weakest—admitting the bird to the college on the day a civilian brought him in with a broken wing in September 2015. She also performed surgery on the bird and was part of his long recovery every step of the way. "This is the best [bird] release of the year—definitely," says Kragness after Bolt flew away. 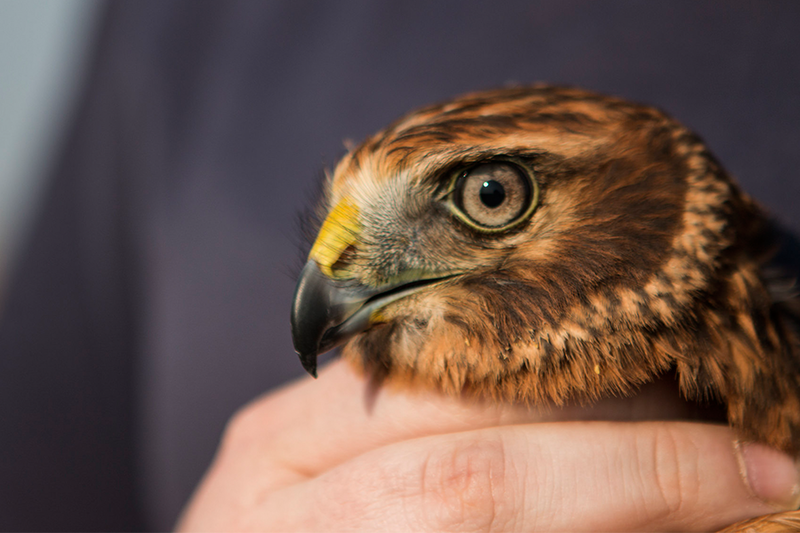 The wildlife team released the northern harrier, a type of long, slim-tailed hawk, near Osler, Sask., where he was found eight months ago. Unable to fly, the injured bird had puncture wounds, a fractured wing and broken tail feathers. After he was brought to the medical centre, WCVM veterinarians examined the bird and X-rayed the fractured wing. They treated and bandaged Bolt's wound and then gave him pain and anti-inflammatory medications as well as fluids under the skin and antibiotic drugs. Bolt spent the winter at the WCVM, recovering from surgery on his fractured wing and receiving rehabilitative treatments including laser therapy to help stimulate cells and speed up healing. In late April the wildlife veterinarians conducted a tail feather transplant on the bird, affixing donor feathers from a deceased bird of the same age and species. The technique, called "imping," was a first for many of the WCVM staff and students involved in the procedure.